Its not every day you get baton-charged by police between turns of scurrying from tonne-weight bovines. 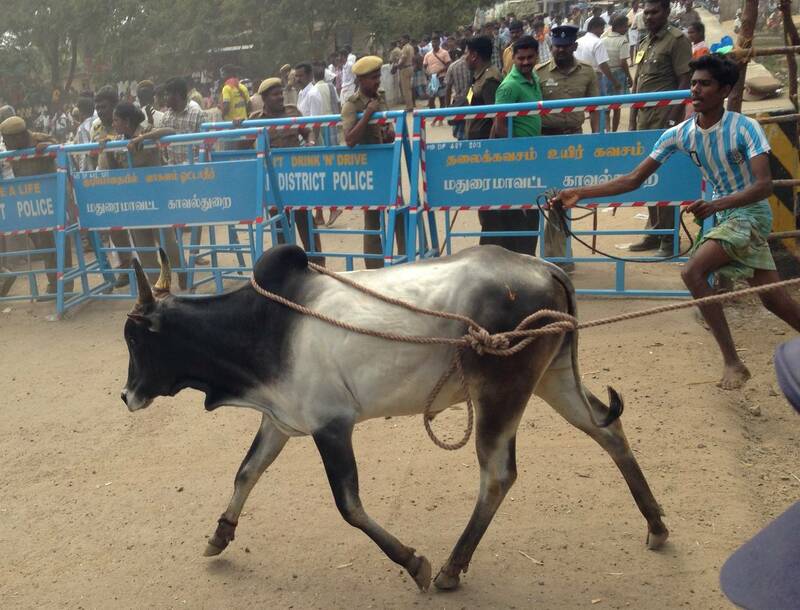 Can only mean one thing – Jallikattu! 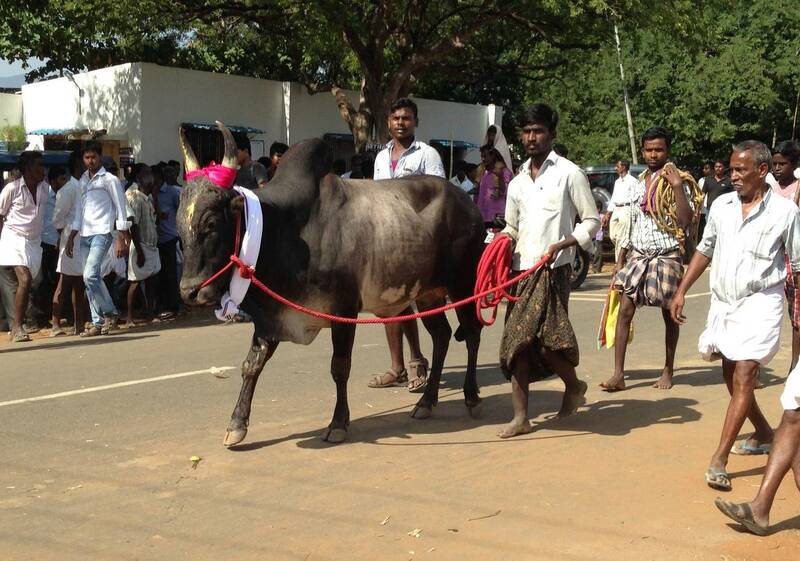 The season for Jallikattu – or bull taming/bull wrestling – restarts in Madurai every year at Pongal. 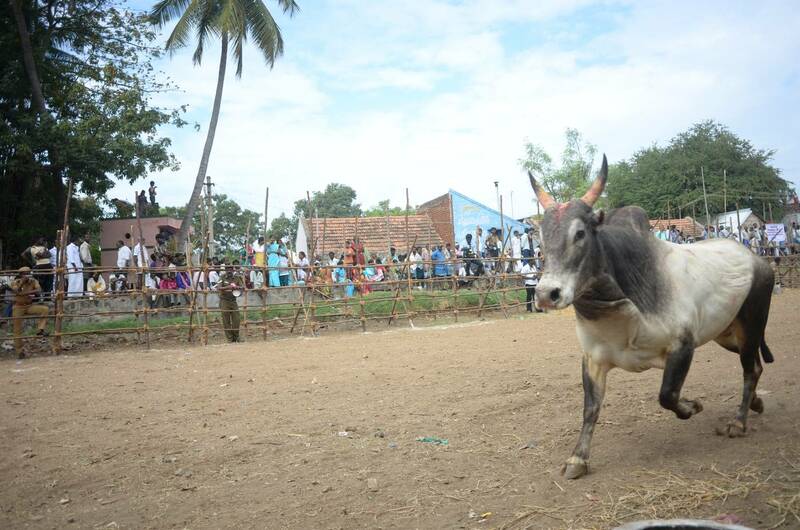 A Tamil rodeo of sorts – villagers from all over Tamil Nadu descend on the Madurai district to be pitted against specially bred bulls. One of the first major events of the year then is the village of Palamedu (pop 8,187) 25km north of Madurai. 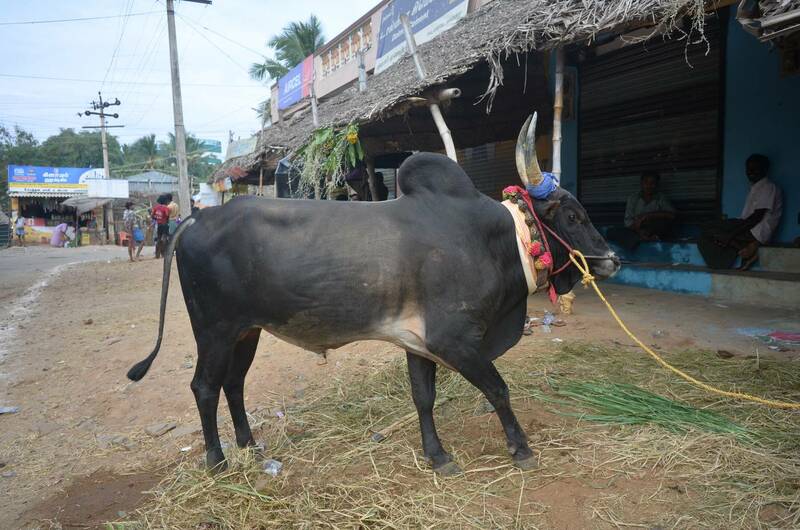 A special breed of semi-wild cow – the pulikulam – is usually found taking part. There were 500+ bulls involved in Wednesday’s competitions. With a long history of shenanigans, in the last couple of years authorities have started a new regime of checking the animals (and competitors) over – so even the bulls have to queue. 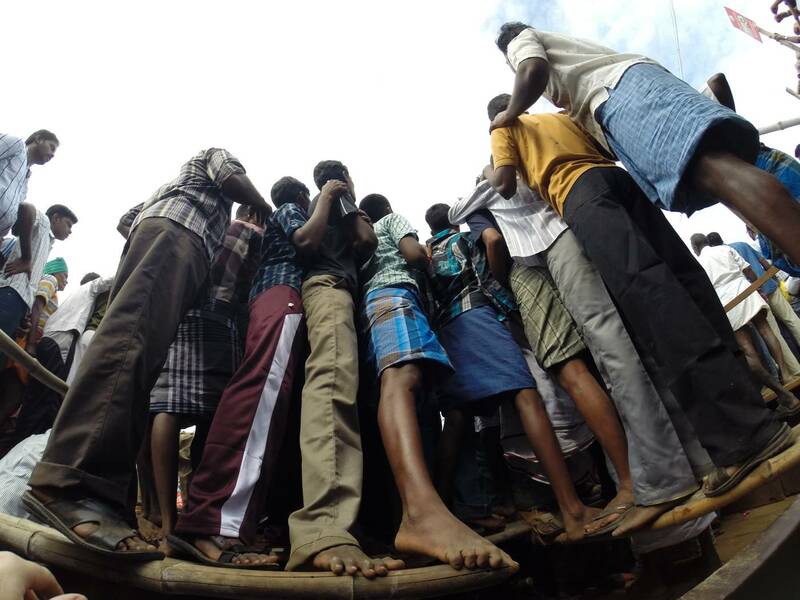 With schools and most businesses closed for Pongal, Palamedu overflows and getting close to the action requires some maneuvering. Although there were plenty of quieter spots further down the track for families. The bulls enter into the arena from the door at the right of the pictures. Tamers, to win have to grab and hold onto to the bull for a particular distance or time. There are also prizes as well for bulls who – presumably – put on the best show. The horns are very real by the way. While they are no longer specially sharpened as was done in the past, that still didn’t stop 40+ tamers needing medical treatment. Police in the arena wear stab vests – not so the tamers. Of course, this is not all without controversy. While ongoing tussles between animal welfare activists and the various central, state and Madurai administrators have brought about, it would seem, much needed regulation, the future of Jallikattu is uncertain. The Indian Supreme Court has gotten involved and while not calling for a ban yet, is said to be keeping a close eye on things. When all is done, the bulls still have to be caught by their owners and this often proves easier said than done. This year several bulls escaped the arena – including one who fell into a well. But for the winning bulls at least, there’s a garland and no doubt an extra helping of rice straw before bed. Lastly, let me wish you all a belated Happy Pongal – farewell from Palamedu! This entry was posted in Uncategorized and tagged Bull Wrestling, Cattle, India, Jalli Kattu, Jallikattu, Madurai, Palamedu, Pongal, Pongol, Tamil Nadu on January 17, 2014 by jp1100001.